Arabsat 6A launch vehicle communications. This one is for the launch of the next Falcon Heavy launching from KSC's LC-39A. Start of operation date gives us a NET on March 7th 2019. It is filled as "Mission 1392" on the permit. NASA made their final attempt to communicate with the Mars Rover Opportunity last night. Nothing was heard back so NASA will stop trying to communicate with it. Opportunity and Spirit were amazing feats of engineering that were slated for 90 day missions and here we are almost 15 years later saying goodbye. 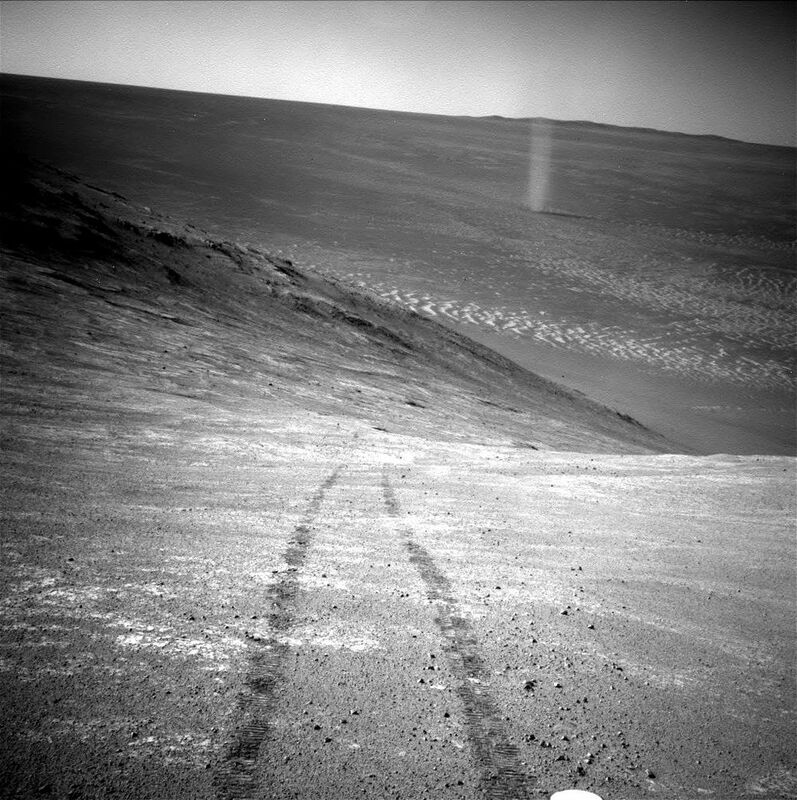 Here is one of my favorite photos from Opportunity with a little dust devil action in the background. I want to see if we could build a Venus rover with modern technology. The idea has been sort of neglected since the Venera program ended and obviously it’s not easy to sustain a machine at 90 atm but there’s still a ton of interesting geological and atmospheric work to be done. Looks like the GOES-16 GLM caught the flash of the meteorite that came down in Western Cuba last week. Yet another cool use for this lighting mapping technology. JAXA has a livestream scheduled on YouTube starting on the 20th, but I think it's in Japanese. The touchdown is going to be tricky, because the surface is strewn with boulders. First movie ever made on asteroid, that. Wow! They've got a backup date in March scheduled if this attempt doesn't work. Mission updates in English are here. Meanwhile, this guy has been spotted in the vicinity . . .
Was looking at it just before sunrise this morning. A Venus program could get a lot of public support, just because this is such a beautiful sight from Earth. Hard to believe that crystalline point of white light is so hellish close up. Another point that could get people interested in more Venus missions is that the planet, apart from its surface conditions just now, is a lot like Earth, at least in size. They've pretty much established that we didn't steal its Moon, though, right? Update, February 28th: Apparently there is a glitch they're working on now. Virgin Galactic had another successful launch this weekend. They even had a passenger! SpaceX has the Dragon crew demo this weekend. Can’t wait to see it! Please stay safe, everyone within reach of today's severe weather! It was pretty cool watching Crew Dragon dock with the ISS and then seeing the astronaut go over into the new capsule. Americans are one step closer to pointing man back in space on US rockets. Falcon Heavy was supposed to launch tonight but they have postponed it until tomorrow due to strong winds. Another spectacular show put on by SpaceX this evening with the Falcon Heavy launch. They landed all three boosters this time. Seems like they get better every launch. Quite amazing really. I missed the launch and landing by like 5 minutes due to some poor planning on my part but watched the replay and it was like they had done this 100 times over. I've been lucky enough have been invited as media to a few SpaceX launches. Hoping to head down and watch a heavy launch in the very near future. I think NASA is about to do some heavy investing in SpaceX as a client. The years of defense/space contractors milking the government for this type of work is coming to an end. Sadly it looks like it will hurt ULA, who makes their rockets in Decatur, AL, if they can't adapt quickly. I barely caught the launch live. I just happened to remember it during my dinner break and went on twitter to see it was happening at almost that moment so i pulled up the live broadcast just as it was lifting off. I had the time wrong. I thought they were going for 6:30 eastern. I don't disagree that contractors milk the government. However, if SpaceX is forced to comply with the requirements levied by the government on most programs, their job will become far more difficult. SpaceIL's moon lander crashed, but reportedly they're going to try again.